Photo courtesy WPU Sports Info. LINCOLN, Neb. 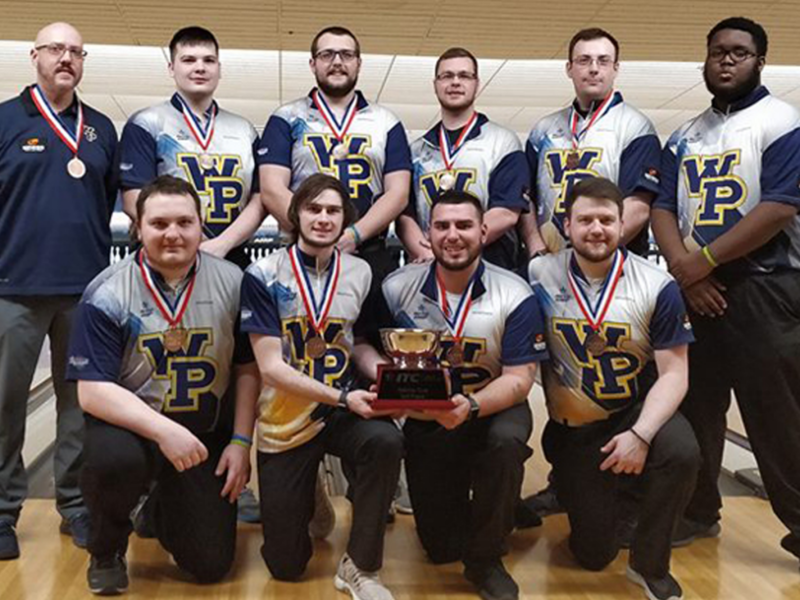 – The William Penn men’s bowling team ran through the gauntlet of emotions Thursday and Friday as it posted a tremendous effort in reaching the semifinal round of the USBC Intercollegiate Team Championships. The program, which was making in its third trip ever to nationals, managed its best finish ever as it was just one round away from a chance at the crown. The Statesmen unfortunately did not come out swinging as they placed 13th out of 16 teams with 4,522 pins during the 24 Baker-game qualifier Thursday. Webber International (Fla.) topped the field with 5,032 pins. It did not get much better for the navy and gold that afternoon as they drew #4 seed Robert Morris (Ill.) in the opening round of the double-elimination tournament. WPU was quickly demoted to the consolation bracket in falling 4-1 by scores of 158-199, 205-235, 149-170, 170-162, 231-258. The best thing then happened to the Statesmen as they got to sleep it off. When the sun came up Friday morning, WPU was a different squad as they stayed alive with a 4-2 upset of #5 seed Morehead State (Ky.) with scores of 211-208, 166-179, 181-209, 180-151, 225-171, 238-225. Then William Penn was given a chance to pull the biggest upset of the tournament as it met top-seeded Webber International. WIU took the first two games, but WPU rallied with three consecutive wins. Unfortunately, its foe claimed the sixth game. Then the craziness began as the teams tied at 203-203 in the seventh game, forcing a winner-take-all eighth round. The Statesmen were up 229-225 in the last frame, but Webber International had a chance to pick up a one-pin spare and then knock down four pins with its final throw. Shockingly, the spare pick-up was missed and the Statesmen took their rabbit’s foot and four-leaf clover into the next round, defeating WIU by scores of 198-219, 191-216, 217-202, 226-224, 211-209, 193-226, 203-203, 229-225. William Penn took full advantage of its new life by rolling past #16 Notre Dame (Ohio) 4-1 (189-151, 206-167, 204-192, 202-257, 193-182) and then sweeping #9 Calumet-St. Joseph (Ind.) 4-0 (211-189, 177-144, 194-128, 212-198) to clinch a spot in the ‘Red’ Bracket finals against Robert Morris once again. Coming from the consolation bracket, the Statesmen would have had to beat the Eagles twice and were nearly halfway there, but could not finish the deal. Carrying huge momentum, they won the first two games and were up 3-2, but RMU rallied to eliminate WPU 4-3 and get to Saturday’s finals against McKendree (Ill.). 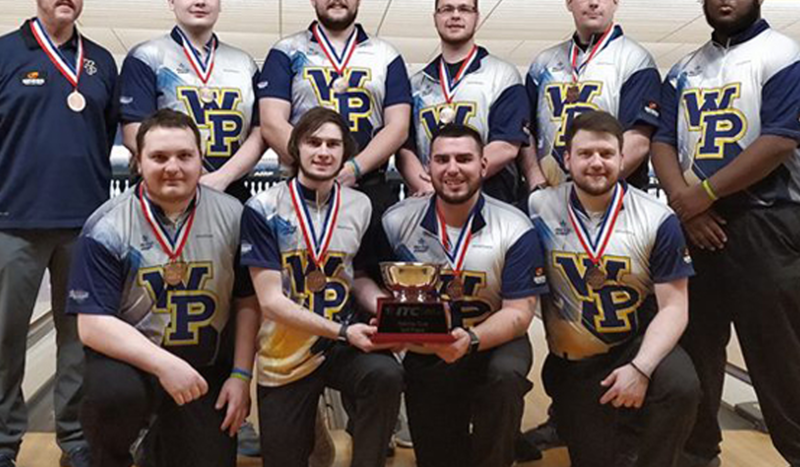 WPU ended its 2017-2018 year with scores of 209-182, 269-190, 196-228, 193-226, 243-188, 216-276, 190-226. Team members included Quincy Bruce (Sr., Cedar Rapids, Iowa, General Accounting), Braxton Coble (Jr., Ottumwa, Iowa, Business Management), David Decker (So., Peyton, Colo., Physical Education), Bret Keimig (Sr., Davenport, Iowa, Physical Education), Aleksander Kostric (Fr., Koper, Slovenia, Sports Management), Rok Kostric (Fr., Koper, Slovenia, Sports Management), Curtis Majka (Sr., Elgin, Ill., Mechanical Engineering), and Nick Walker (Jr., Zeeland, Mich., Business Management).